I’ve never driven an Accord before. I used to want one, quite a bit actually. I’ve ridden in a few, but one of the things that struck me about this car is the sheer volume of Accords I saw on the road. All styles, years and colors! That speaks volumes as to how popular and long-lasting these vehicles really are, and just how much Accord owners love their cars. I did actually expect the car to ride more like a luxury vehicle. It really isn’t one, and once I got past my high expectations, I had a very positive experience. While it’s not a LARGE vehicle, it sure feels like one inside. It’s very roomy, unless you’re 7’0″, then it might become an issue… Parallel parking was a cinch! The Accord has Honda’s cylinder-deactivation technology, which allows the engine to run on six, four or three cylinders depending on driving conditions for maximum fuel economy. This probably accounted for the lag going up a steep, twisty road (I noticed the ECO light showing as “on” on the dashboard often). Being a Honda, it will surely live up to the Honda name. Built solid and built to last. And take a look around on the highway. You will see Accord after Accord after Accord. So many different years, styles (coupes, sedans and remember the wagons?). This car will withstand the test of time and pavement pounding. The trunk is plenty large, and I folded the rear seat down and was easily able to fit a bike in there. Of course, I put the bike in the back seat too, and that also worked equally well. When I folded the rear seat down, and then lifted it back up and into place, I didn’t have to double check it. It solidly locked back into position. The build is equally solid on the inside as it is on the outside. I popped the hood and the engine is laid out nicely and logically. Since I didn’t try to change the headlamps (my favorite) or other lights, I can’t say whether or not they’d be easy to do, but it sure appears that stuff isn’t wedged in. This car felt MUCH larger inside than it appears from the outside. Very roomy, and very comfortable. Everything was within easy reach. The navigation system was easy to deal with, and easy to change the display to swap the direction shown (I prefer the direction I’m heading in UP, otherwise, I get turned around). This is probably not something that will happen to many, if anyone. However, should you ever get kidnapped and locked in the trunk, you’d better hope you’re driving this Accord. The release lever for folding down the rear seat is in the trunk, and when I pulled it and realized exactly what it was for… this was the first thing that crossed my mind! Pull the lever, push the seat forward, and voila! You’re no longer locked in the trunk. Wonder if the trunk release is in there too? Shoot, I should have kept searching. The instrument panel was great. Leaner on the bells and whistles, yet gives you just enough information. Clean, not cluttered. The wood trim is nice, and makes the car look far more expensive than it is. Along those lines, the leather interior was also really nice, and the seats were very comfortable. The all-important seat heaters were nice too, with a high or low setting. The cruise control was intuitive and easy to set, without having to search around to find out if it was ON, or how do I set the speed?, etc. Given the instrument panel was so clean, the whole center console area is kind of a mess. Buttons, buttons, everywhere! If I owned this car, I’d take the time to learn where everything was located. But for a new driver, in traffic, trying to switch from the CD to XM-radio… You’d be best advised to pull over and figure it out. With a 268-horsepower, 3.5 liter, 24-cylinder SOHC i-VTEC V6 engine, this trim line is light years ahead of all the other Accords. The pick-up while traveling at speed is great. A quick stomp on the accelerator and you’re zooming past cars you need to pass. The power was just right. Not too much, and not too little. It did bog down going slowly, up a winding hill. But I think that most cars would, as 15 mph uphill into a hairpin turn is probably not where one would experience maximum performance out of most vehicles. With its double-wishbone front suspension, independent multi-link rear suspension, variable gear-ratio power-assisted rack-and-pinion steering and power-assisted ventilated front disk/solid rear disk brakes you get a solid handling vehicle that can decelerate as reliably as it accelerates, all wrapped up in a comfortable-feeling automobile. With all fun we had testing the new Accord, we only got 22 mpg. Your fuel economy should improve with a lighter foot on the accelerator. I thought this car handled very well. I drove it over a narrow, twisty uphill road, and even though I had a bit of bogging down in the engine, the handling was superb. It came around corners nicely and I never felt like I was tugging the wheel to stay in my own lane. I also was able to drive it down a fast, curving road and it again showed itself to be very well-mannered in the handling department. I wouldn’t characterize it as being far superior to a sports car, or a different sedan, but it was a very nice handling vehicle. I thought this car was beautiful. The color and lines are really, really nice. It appears to be following the styling of the Camry and Lexus sedans. It was really beautiful to look at, and really doesn’t look like the Accords of yesterday. I could actually characterize it as “exciting” to look at. Exciting to walk up to it and realize, “Hey, I get to DRIVE that!”. Nice, rounded edges, and swooping glass. Seriously, the ONLY thing that I could actually find wrong with the car (and I’m reaching here), were the headlamp covers. When viewed from the front, or directly from the side, there is nothing wrong with them. But if you view them from just the right angle, they reminded me of those goldfish with the bug eyes. Just my opinion, but it would not stop me from owning this car. For the sheer volume of Accords STILL on the road, I’d have to say that this car is worth whatever you are willing to pay for it. Obviously, this is one car that will LAST and withstand the rigors of traffic, weather and time. It’s nice to look at. Fun to drive. It has a navigation system, XM® Satellite Radio, cruise control, a 6-disc in-dash CD premium sound system w/7 speakers and sub-woofer, leather interior, heated seats, power moon-roof, auto-on headlamps, dual-zone climate system, Bluetooth® hands-free and more items than I could possibly list. And then, let’s talk safety. 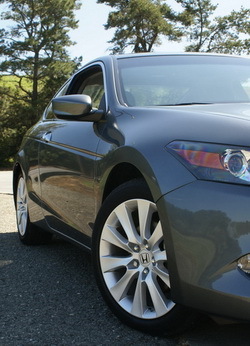 The Accord has a 5-star rating for: passenger, driver, side-impact front, roll-over. The only safety “ding” is a 3-star rating for the rear side-impact. How could you possibly go wrong buying this car? This was a sweet car. A real pleasure to drive. Tons of options available with this car. You can choose the base LX model with the economical 4-cylinder engine or go totally pimped out with the EX-L model that has all the desirable luxury features and a 268 hp V6 engine with Variable Cylinder Management™ (VCM®). Our test model even had chrome door handles! Beautiful to look at. Easy to park. Made me want to leave work early just to go for a drive (wait, I DID do that!). This would be a car that you could have for your family, and then take your spouse out in for a great night on the town, without feeling like a soccer mom, or little-league dad. It’s “hot”, all while being sensible and buttoned-down. If you like having something that no one else has, then this is definitely not the car for you. But if you want a car that’s safe, and will last you a lifetime (or at least a decade or two), then this is your car. >> Official website for Honda cars, minivans, trucks, crossover utility vehicles, and hybrids: American Honda Motor Co.
2009 Ford F-150 Review – New and Improved! But you probably didn&#039;t notice.